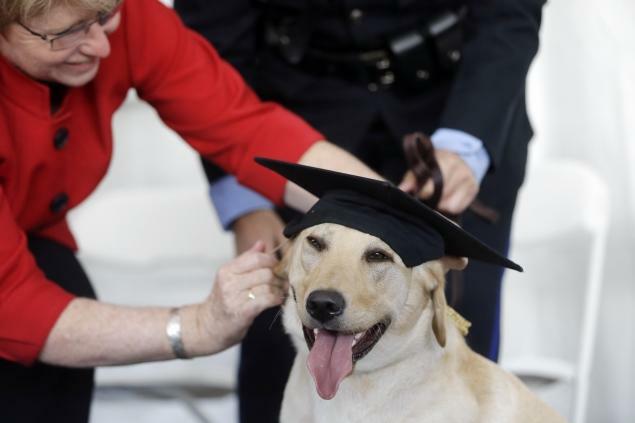 The University of Pennsylvania’s Working Dog Center held its first commencement ceremony Tuesday, graduating seven dogs. The center opened last September and was inspired by the canine rescue work on 9/11. The first graduating class contains many talented dogs that will go on to work as search and rescue dogs, medical alert dogs and police dogs. Socks, one of the members of the first class of graduates from the center, was fitted with a mortarboard and tassel at the commencement ceremony. Socks will be starting a career with the University of Pennsylvania campus police force. The other graduates of the program are still awaiting permanent placements, but there has been significant interest in all of them. The dogs excel at a range of skills and each dog’s skills are customized to their temperament and abilities. One of the graduates, Thunder, will likely go on to be a search & rescue dog. “He is bold, he is strong, he has no fear on the ruble, and he will search like a machine, which is exactly what you want in a disaster setting,” said Cindy Otto, Centre's Executive Director. One of the more mellow graduates, Bretagne, is likely to be placed as a diabetic alert dog. The second class of dogs training at the University of Pennsylvania’s Working Dog Center is already hard at work. The dogs are donated to the center by breeders and while they train there they live with foster families in the area. For more information on the center visit their website.